April 30. – In the afternoon I took passage on the steamer Balloon, and after encountering a severe gale on the bay arrived at Baltimore about ten o’clock at night. On my return there I found the tide of revolutionary opinion decidedly ebbing. The national flag had reappeared in some places, communication with the North had reopened, and men no longer boasted in public of their complicity in the proceedings of the mob. Having at length succeeded in concluding the business for which I came, on the 2d of May I returned to Charlestown, Virginia. The Battery, Harper's Ferry, by D.H. Strother. In returning through Harper’s Ferry I found the plot had thickened considerably during my absence. The militia general, Harper, had been suspended in command by a Colonel T.J. Jackson, formerly of the United States Army, and latterly a professor at the Virginia Military Institute. There were probably at this time five thousand men assembled here, including regiments from several of the Southern States. 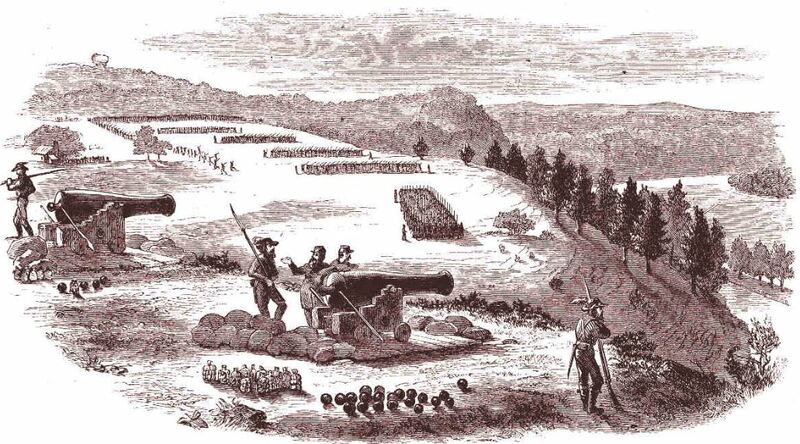 A regiment of Kentuckians, under a Colonel Duncan of Louisville, had arrived, while detached companies and individual sympathizers from Maryland were being organized into a battalion. Several field-guns were in position commanding the railroad approaches, while batteries were exhibiting on the neighboring cliff-in localities which struck me as more picturesque than judicious. Although still very perfect in organization and discipline, and deficient in arms, ammunition, clothes, and equipments, the troops already showed the presence of a military head. Among the volunteers from Berkeley and Jefferson I perceived a good deal of discontent and disaffection. Two weeks of soldiering had already told on the enthusiasm of the feeble, while many of the more thoughtful, who had been decided Union men, found themselves in an awkward position between their political views and interests and their implied military engagements. Some with whom I conversed hoped to be delivered from their difficulties by the rejection of the Act of Secession by the people, and expressed their determination to vote against it if the opportunity was allowed them. I talked freely to a number of acquaintances, and earnestly advised several young men, in whom I felt an especial interest, to get out of it while there was yet time. Captain Botts looked haggard and care-worn, like a man who felt the force of the classic epigram, “nolentem trahunt fata.” He evidently avoided conversation with me, and I did not press it. I took the liberty of emphasizing specific passages above. Pay particular attention to what amounts to either a reluctance to participate in the affair to begin with, and/or a rapidly developed disaffection for the new “cause”. More to follow on May 6.